Winner of the 2001 Pulitzer Prize for Poetry. Practical Gods is the eighth collection by Carl Dennis, a critically acclaimed poet and recent winner of one of the most prestigious poetry awards, the Ruth Lilly Prize. Carl Dennis has won acclaim for "wise, original, and often deeply moving" poems that "ease the reader out of accustomed modes of seeing and perceiving" (The New York Times). Many of the poems in this new book involve an attempt to enter into dialogue with pagan and biblical perspectives, to throw light on ordinary experience through metaphor borrowed from religious myth and to translate religious myth into secular terms. While making no claims to put us in touch with some ultimate reality, these clear, precise, sensitive poems help us to pay homage to the everyday household gods that are easy to ignore, the gods that sustain life and make it rewarding. 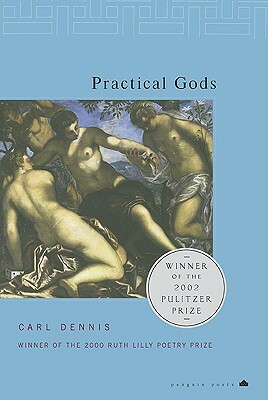 Carl Dennis is the author of nine books of poetry, including Practical Gods, winner of the 2001 Pulitzer Prize for Poetry. A recipient of fellowships from the Guggenheim Foundation and the National Endowment for the Arts, in 2000 he was awarded the Ruth Lilly Prize from Poetry Magazine and the Modern Poetry Association for his contribution to American poetry. He teaches in the English Department at the State University of New York at Buffalo, and is a sometime member of the faculty of the MFA program in creative writing at Warren Wilson College.